Many of us are familiar with the term Montessori as it applies to education but fewer are familiar with the application of Montessori for Dementia. 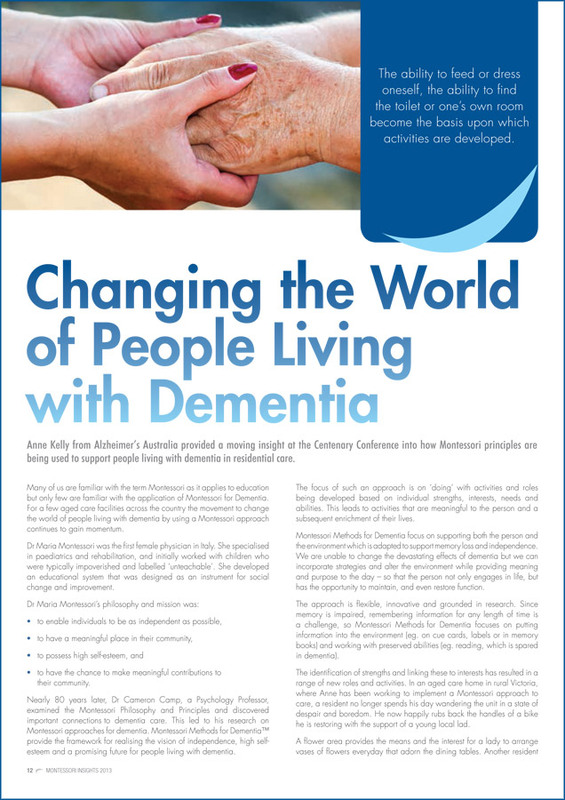 However, in a growing number of aged care communities across the country the movement to change the world of people living with dementia by using a Montessori approach is gaining momentum. Dr Maria Montessori was the first female physician in Italy. She specialised in paediatrics and rehabilitation, and initially worked with children with disabilities who were labelled ‘unteachable’. She developed an educational system that recognised and responded to the need of all people for active and meaningful involvement in their world, that became an instrument for social change and improvement. Nearly 80 years later, Dr Cameron Camp examined Dr Montessori’s philosophy and principles and discovered important implications for dementia care. 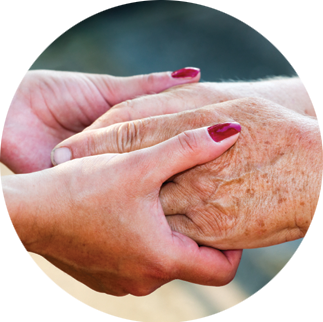 This led to his research on Montessori approaches for working with people with dementia. Montessori Methods for Dementia™ provided the framework for realising the vision of independence, high self- esteem and a promising future for people living with dementia. The focus of this approach is on ‘doing’, with activities and roles being developed based on individual strengths, interests, needs and abilities. This leads to activities that are meaningful to the person and a subsequent enrichment of their lives. Montessori Methods for Dementia focus on both supporting each individual, and on the creation of an environment which is adapted to support those with loss of memory and independence. We are currently unable to change the devastating effects of dementia but we can incorporate strategies and alter the environment to provide meaning and purpose to the day – so that the person not only engages in life, but has the opportunity to maintain, and even restore function. The approach is flexible, innovative and grounded in research. Since memory is impaired, remembering information for any length of time is a challenge, so Montessori Methods for Dementia focus on putting information into the environment (eg. on cue cards, labels or in memory books) and working with preserved abilities (eg. reading, which is spared in dementia). The identification of strengths and linking these to interests has resulted in a range of new roles and activities. In an aged care home in rural Victoria, where Anne Kelly has been working to implement a Montessori approach to care, a resident no longer spends his day wandering the unit in a state of despair and boredom. He now happily rubs back the handles of a bike he is restoring with the support of a young local lad. A flower area provides the means and the interest for a lady to arrange vases of flowers everyday that adorn the dining tables. Another resident sits at the table placing pegs around a bowl, a fine motor skill activity which enables her to practise and maintain the skills she requires to keep feeding herself. She was at risk of losing those skills but thanks to a Montessori approach to care this is no longer the case. A resident who spent her life working as a nurse had fallen into the routine of staying in bed most of the day. She became very agitated and angry when staff attempted to get her out of bed. But she could still roll bandages as well as she did all those years ago when she was a young nurse. From rolling bandages, she has progressed to folding face washers and serviettes, and with the opportunity to build her capacity by engaging in activities repeatedly, she is able to fill sugar bowls. She now has several activities and roles that fill her day, and she no longer returns to bed at every opportunity. Before this approach was taken, all residents from the dementia units were in bed by early evening. Now the units are abuzz with reading groups, Beyond Bingo games or singing. The norm now is for residents to start retiring to bed after supper at around 9.30–10.00pm. Orientation cues adorn the walls along with interactive wall spaces. Signs invite residents to self initiate activities such as folding face washers, serviettes, going for a walk in the garden or even pouring a drink for themselves. Once upon a time there were eight residents on Risperidone (an anti- psychotic drug), now there are none. Once upon a time there were residents receiving nutritional supplements, now these are not needed. Residents now choose the food they wish to eat from a Bain Marie and they can return for seconds or thirds if they wish. All food is labelled so they know what they are choosing. Red plates which provide good contrast to the food are used to enable residents to eat independently. Diversional Therapists are now Rehabilitative Therapists where the emphasis is on activities that will maintain function as well as individual activities that embrace a sense of community and purpose, and bring joy and meaning to life. The ability to feed or dress oneself, the ability to find the toilet or one’s own room becomes the basis upon which activities are developed. The majority of residents now have a role to fulfil in the unit and this has resulted in a sense of community and belonging. In an industry where funding is determined based on deficits, the journey to change care practises has been difficult. Implementing a Montessori approach to care has required a shift from a deficit focus to a strengths focus. Staff and management have had to challenge long held beliefs and attitudes. This gets easier as residents flourish and the positive outcomes are witnessed by all. No longer is it called a Secure Unit, or Dementia Care Unit or Special Unit, but rather a Memory Support Unit – a unit where the environment is set up to support a person’s memory loss and where, through a Montessori approach, staff encourage residents to function to the highest level possible. There is an understanding and acceptance that while a person’s level of dementia cannot be changed, nor the disease process halted, each person has the right to be assisted and encouraged to be as independent as possible and have meaningful, productive and happy days. Montessori Methods for Dementia can be adopted and applied anywhere where people with dementia live or are cared for: their own home, residential care facilities, day respite programmes and acute care facilities.